Christmas is just around the corner. Time to fetch the Christmas tree ornaments from the attic and consider how best to decorate your own four walls for the festive season. Wreaths are always a good idea. They look good both on the front door and around the home. Let us show you how can make a festive Christmas decoration in next to no time in a few easy steps with the right tools. Buy branches that have been coloured white to make an attractive wreath or spray paint branches that you have collected white. Bundle them and bend them carefully into a wreath. Then fix them unobtrusively with wire at regular intervals. Draw a star on a sheet of wood using a set square and a pencil. How? You superimpose two equilateral triangles on each other. Each has an angle of 60°. The apex of the first triangle points upward and the superimposed one points downward. If the hexagram, as the equilateral six-pointed star is also known, is a success, sawing is the next step. 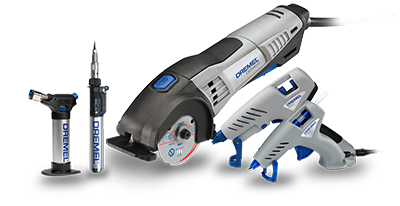 Use the Dremel® 4200 and the EZ Speedclic woodcutting wheel SC 544 to cut off the superfluous wood along the pencil line. 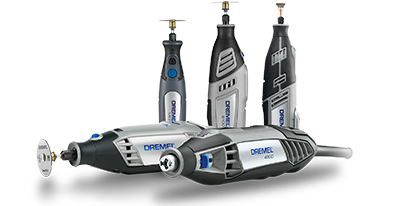 Put a 6 mm wood drill (636) bit in your Dremel® 4200, which thanks to the EZ Change quick switch system does not involve using a wrench or spanner. Drill a hole between two sharp points of your star. You will use it later to fix the star in the wreath. Spray paint the star red on both sides and allow it to dry. Write your Christmas greeting - Merry Christmas, for instance - on the star. Run the ribbon through the hole you drilled and make it just long enough for the star to hang in the centre of the wreath. Use your Dremel® Glue Gun and gluesticks GG02 to add the final decorative highlights to your wreath by gluing a few mini Christmas tree balls to it at regular intervals. Wait till the hot plastic has cooled down and hang up the wreath with the star in the middle - Merry Christmas!